PANV is . . .
a member of the National Federation of Paralegal Associations (NFPA) which provides PANV members automatic membership in NFPA. 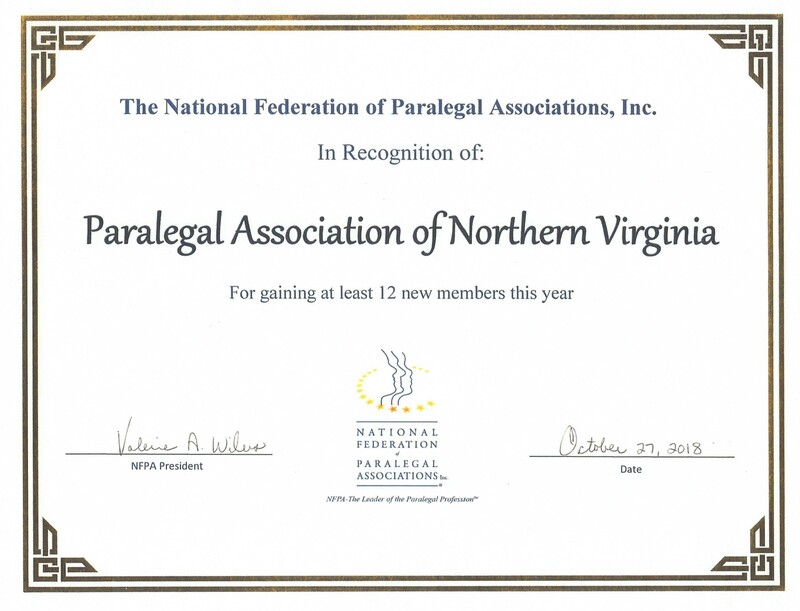 PANV is also a member of the Virginia Alliance of Paralegal Associations (VAPA) and all PANV members are automatically members of VAPA. Enjoy great networking opportunities with your fellow paralegals, broaden or update your skills with PANV seminars and also enjoy the benefits of membership in NFPA and VAPA when you join PANV. Take your career to the next level with PANV! Gov. 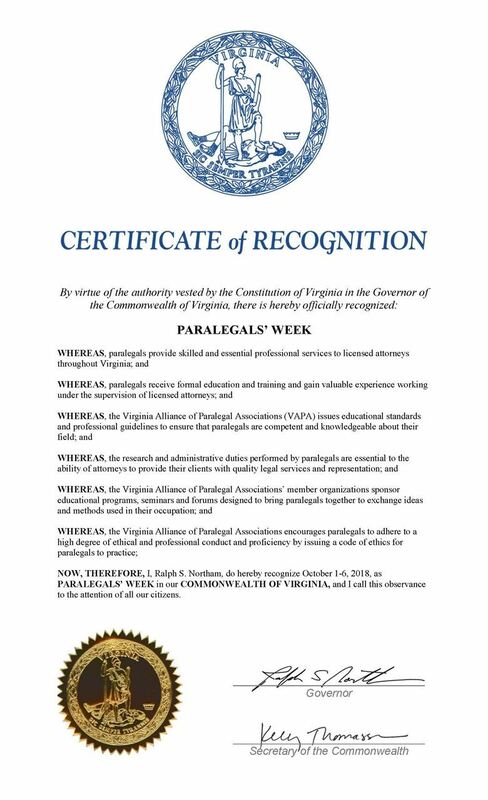 Ralph Northam has officially recognized October 1-6, 2018 as PARALEGALS' WEEK in the Commonwealth of Virginia. Enjoy the recognition we work so hard to achieve!!! On June 6, at PANV's Annual Meeting, Pamela Bass, AACP, VARP became the winner of PANV's first Paralegal Certification Scholarship. Pamela's scholarship will cover the costs for her to sit for the Paralegal Advanced Competency Exam (“PACE”). Congratulations Pamela! Let the studying begin - PANV will be here to support you through the whole process! PANV thanks our wonderful judges, Ann Hodges, PACE Emeritus and PANV member, and Attorney Maria Coyle, for their time and effort in evaluating each of the candidate's applications submitted for the Paralegal Certification Scholarship. PANV also wants to congratulate another member, Cherith Kennedy, who was named the 2018 Pro Bono Paralegal of the Year, for her work at Legal Services of Northern Virginia. Cherith received her award at the Annual Northern Virginia Pro Bono Reception on June 7, 2018, at the Fairfax County Courthouse. Congratulations Cherith! Are you a natural born leader or organizer or just want to get more involved in your profession? Your Association needs you! PANV has openings for director positions as well as committee chairs. If you're interested in becoming more involved in the planning for the future of our profession here and nationally, please consider taking on a more active role at PANV. If you're interested or just have questions about what positions are available as well as the associated duties/time commitments, please do not hesitate to contact Kathi Ingram, RP. Fresh ideas are always welcome! During the 2018 NFPA Annual Convention President Valeria Wilus recognized those associations meeting and/or exceeding her challenge to obtain at least 12 new members. PANV exceeded that goal with 27 new members.